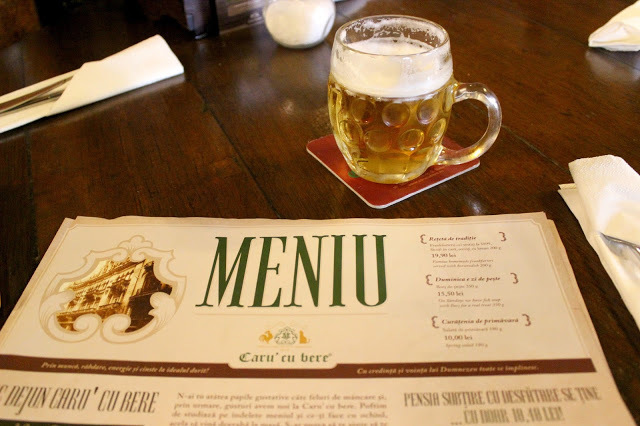 Welcome to Caru Cu Bere in Bucharest! And yes, I feel lucky I have been there a few days ago! 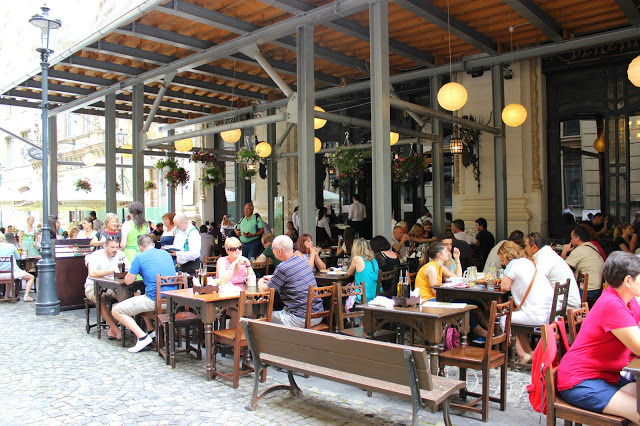 This amazing restaurant became on of my favorite!! 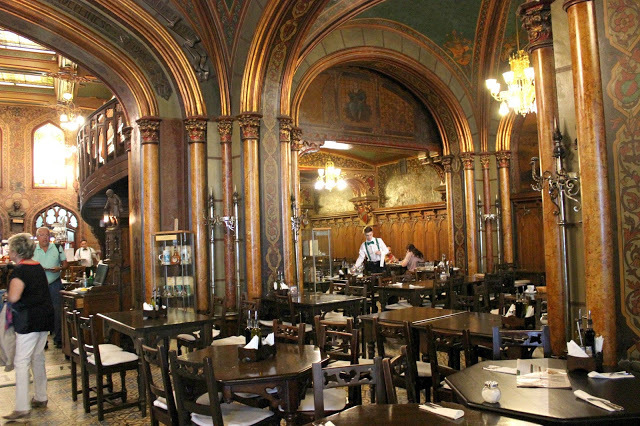 An amazing bar and restaurant, opened in 1879, in a gothic revival building designed by Austrian architect Siegfrid Kofczinsky. 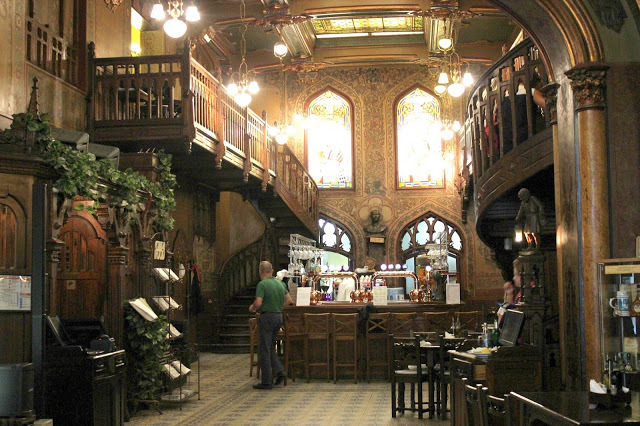 It is noted for its interior decoration, in art nouveau style. The feeling was amazing, because when I had my lunch I was enjoying also classic music by 4 ladies and it was like being in the past. The personnel were all of them really polite and they were willing to help you to choose what to taste, since there were available too many traditional dishes! I had my information before I went there , because I have to admit that when I tried to choose something from the menu, I got confused. Too many dishes, too many tastes and I was not that hungry! So, I end up to a few traditional dishes and I really enjoyed them! Sarmale cu Mamaliguta for the beginning along with Cheese Dumplings!!! Sarmale is a dish made of rolled minced meat (pork usually) mixed with rice and herbs and covered in cabbage leaves. 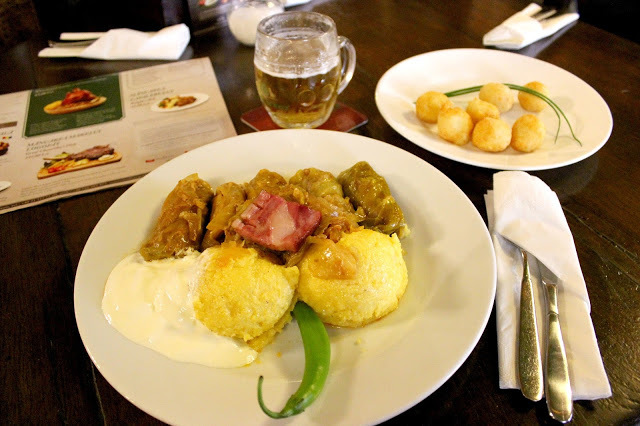 It is usually accompanied by Mamaliga (or Mamaliguta) – polenta made of boiled corn flour, as well as by hot peppers and sour cream. 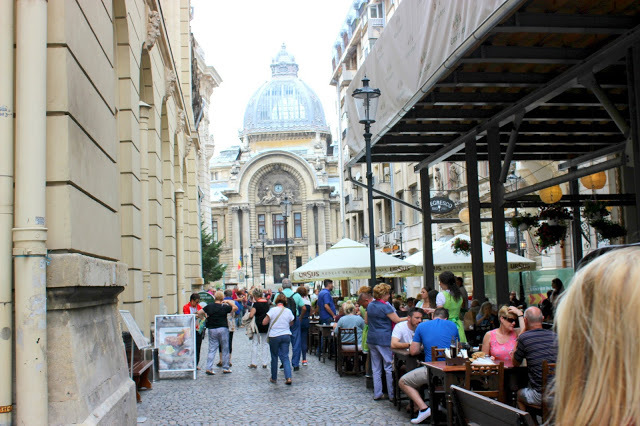 My dish had also a small piece of Smoked bacon – “Slănina afumată” just to taste it…and it was just enough to make me decide that next time in Bucharest I will try this dish! 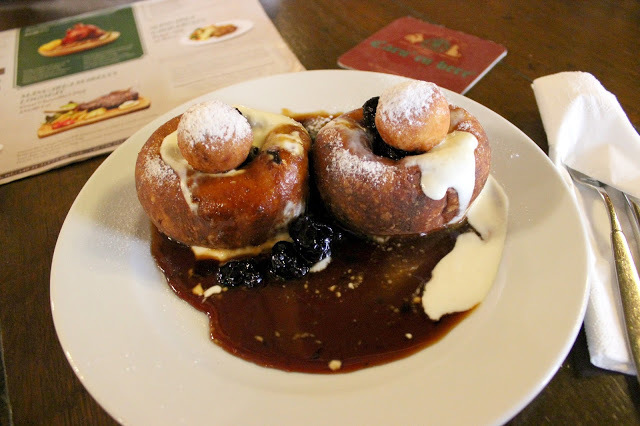 For the end just keep some of your appetite because you definitely have to taste Papanasi, a traditional Romanian dessert, which are fried cheese-filled pastries similar to doughnuts, served with a dollop of cherry jam and sweetened sour cream. Just amazing! And a coffee please…. 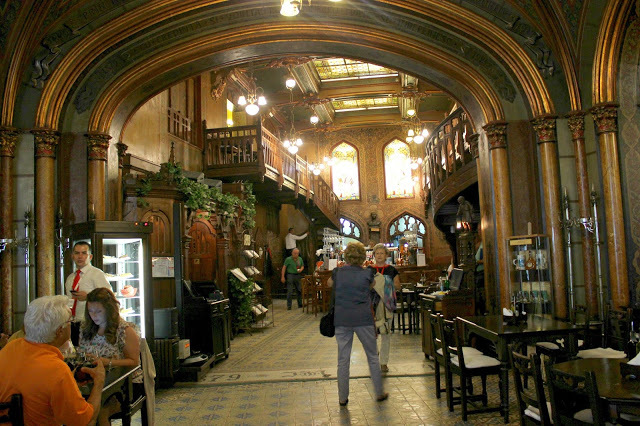 If you even been in Bucharest you have to visit Caru Cu Bere, it is just gorgeous, a place that you will never forget. 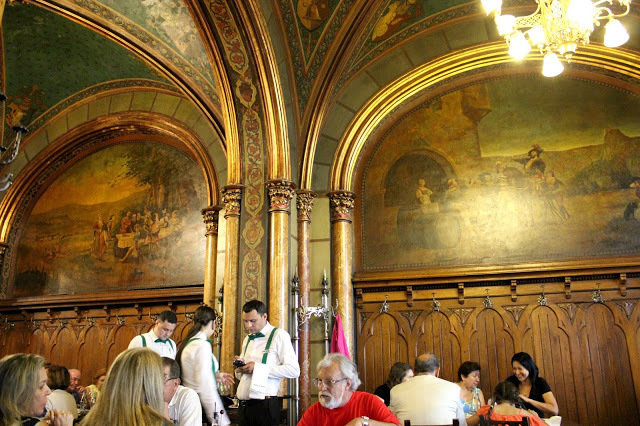 Imagine that I was there alone and to be honest I was not feeling comfortable eating also alone…but after a couple of minutes this feeling just gone away…the music, the decor, the people were amazing and I was feeling like I was in a big event with friends! Αφού βρήκες τραπέζι να κάτσεις!Εμείς δυστυχώς ήμασταν με γκρουπ και δεν μπορέσαμε να καθήσουμε μόνο το είδαμε!AriadnefromGreece! ειχα κλεισει 2-3 μερες πριν Αριαδνη. τυχερη ημουν! παντα πισω απο μια καλη αναμνηση δεν υπαρχει μια γευση ή αρωμα??? χιλια ευχαριστω Λιλια μου! Μου άνοιξες την όρεξη καλέ! Και για φαγητό και για ταξιδάκι! Ωωω πολύ όμορφες εικόνες!! Να περνάς πάντα έτσι όμορφα Ζήνα μου! !